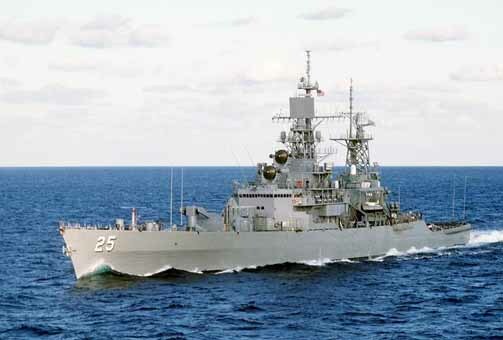 The USS BAINBRIDGE (CGN-25), a nuclear version of the Leahy class cruiser, was commissioned on 6 OCT 1962 as DLGN-25. Built by the Bethlehem Shipbuilding Corp. at Fore River Shipyard in Quincy, Mass., USS BAINBRIDGE began her service career with a deployment to the Mediterranean in February 1963. another "MED" followed in 1964 that extended into Operation Sea Orbit - an around the world crusie with USS Enterprise and USS Long Beach. In June 1966 BAINBRIDGE shifted her homeport to Long Beach, California and began a series of Western Pacific deployments in support of the US effort in Vietnam. After nuclear refueling in 1983-85 BAINBRIDGE joined the Atlantic Fleet and finished her service career over the next thirteen years with a variety of deployments; Caribbean, Mediterranean, Indian Ocean and combat engagements off of Libya and Kosovo. USS BAINBRIDGE served her country for 33 years, 11 months and 7 days, until decommissioned on 13 SEP 1996. BAINBRIDGE was disposed of at the Puget Sound Naval Shipyard Nuclear Recycling Program in the late 1990s.